A variety of devices may be used to execute this exercise, the important element is that the device is firmly secured and should hang down to one's shoulders when kneeling on the ground. 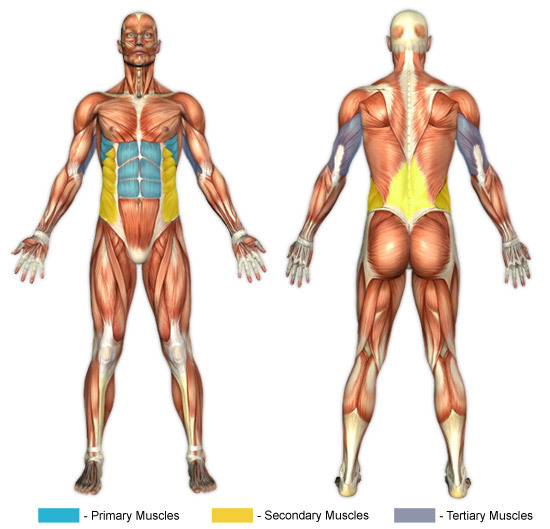 Stability and control of the body is paramount while performing ab extensions. Slow and controlled movements allow for the muscles to contract for a prolonged period of time, resulting in a highly targeted exercise. Improvisation with the setup of ab extensions is completely acceptable. One can use anything ranging from a towel, to ab straps, or even in a pinch, resistance cables (just be sure they can firmly support your body weight). Do not round or arch the back. Not only does this remove emphasis from the muscles but places stress upon the vertebra. It is also advised to lay down a soft object such as a towel or yoga mat to protect the knees while they press and roll against the floor.